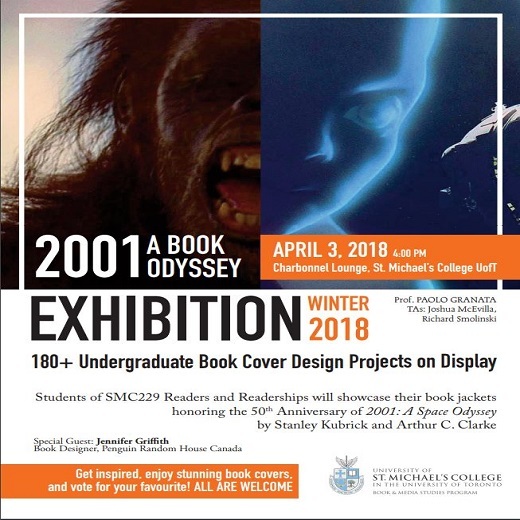 On Tuesday April 3 at 4:00 p.m., 180+ undergraduate book cover design projects will be on display in Charbonnel Lounge. These books were designed by Professor Granata's students in SMC229 class. The students are excited to showcase their book jackets honouring the 50th Anniversary of 2001: A Space Odyssey by Stanley Kibrick and Arthur C. Clarke. Special guest to this event is Jennifer Griffith, Book Designer, Penguin Random House Canada. Get inspired, enjoy stunning book covers, and vote for your favorite! All are welcome to attend.